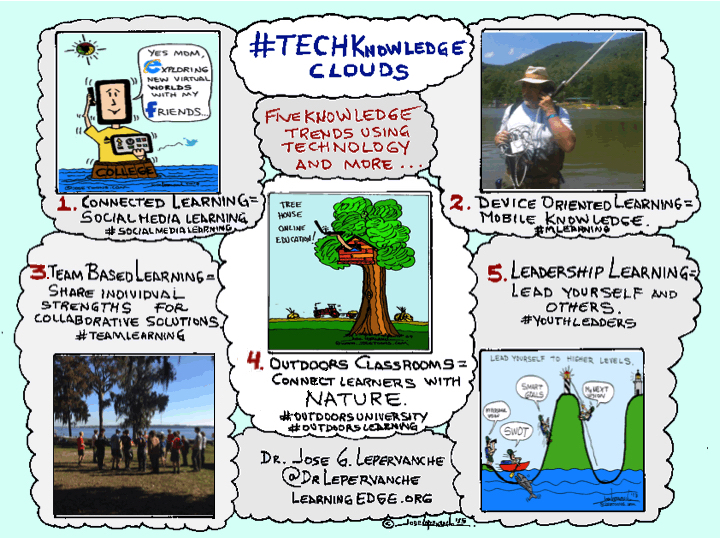 How to combine technology and the outdoors to improve knowledge. We are all connected to people and nature. The university is outdoors. 3. Team Based Learning = Share individual strengths for collaborative solutions. #teamlearning. 50 Education Technology Tools Every Teacher Should Know About – Edudemic. Smartphones make a difference. Students who use their smartphones as study devices study more often and more efficiently. The Teleducator Network is our Navigational Chart to access our current educational, business, and community resources. The idea came while looking for solutions to reduce Information Overload in our online courses. The Teleducator Network is an information and knowledge integrator where topics are organized by type of resources. Channels is about You Tube videos. Community has links to several organizations where I volunteer. Courses contain links to all courses including website companions, reading or slides. Labs are past and current project to enhance management, leadership, and systems courses and to test emerging technologies and methods. Students are involved on these labs using discussions, assignments, or team projects. Newsletters include paper.li and Scoop. Social media is an area to link to several Facebook pages, Linkedin, and Twitter. Websites & Blogs include personal and professional websites, blogs, and collaboration in other websites. The Teleducator Network is always “under construction” as new resources are constantly added. Professors and students are invited to use and share resources, not only during a specific course, but as part of a continuous lifelong learning experience. Browse through our online resources using the links on the left, or by using the drop-down menu at the top of this site. You can also search for specific things as well. America’s Facebook Generation Is Reading Strong : NPR.